Younger sister of 2004 Olympic 10,000m silver medallist Ejegayehu (b. 1982) and World and Olympic 10,000m Champion Tirunesh (b. 1985). Cousin of two-time Olympic 10,000m champion Derartu Tulu. Left school in the eighth grade. Genzebe Dibaba’s indoor personal bests are all World records or bests, clocked in February of 2014, 2015 and 2016, over distances from 1500m (3:55.17) to 5000m (14:18.86). Those accomplishments, including the 4:13.31 mile World record she ran this February, mean the outdoor 1500m World Champion Genzebe is favored to defend her 2014 title in the Portland 2016 World Indoor Championships 3000m, an event in which she clocked an 8:16.60 World record two years ago. Genzebe Dibaba is the younger sister of the three-time Olympic Champion Tirunesh, who followed her older sister Ejegayehu, the Athens Olympic 10,000m silver medalist, into athletics. A theme that runs through Genzebe’s young but thriving career is the constant presence of her sisters, but especially Tirunesh with whom her years of international racing overlap more than Ejegayehu. Whether she is setting an example, or by her side at championships, or encouraging from afar, Tirunesh has continually guided and supported her little sister. Genzebe grew up in the family home outside the now famous town of Bekoji in the Arsi zone of central Ethiopia, south of the nation’s capital Addis Ababa. Bekoji-area natives in running include Olympic champions Fatuma Roba and Derartu Tulu, the Dibaba sisters’ cousin, as well as men’s double Olympic champion Kenenisa Bekele. Attending the same Bekoji Elementary School her sisters had gone to, Genzebe used to run in school races. “I used to beat everybody at school, and a teacher said to me, ‘Why don’t you pursue running like your sisters?’” she said. Taking this sound advice she eventually began to train with Sentayehu Eshetu, the same coach who had previously nurtured the young Tirunesh and Kenenisa. “He used to tell me, ‘OK now, be strong, be like your sisters, work hard’,” recalled Genzebe, who also hoped to emulate her siblings. Genzebe represented Bekoji at a regional championship in Asela in early 2005 and placed third, making the team that would represent the Oromiya region in Addis Ababa at the national championships, where she was eighth. Her first international competition was a road relay race in China. In late 2005, Genzebe was recruited into the Muger Cement Factory athletic club of which Kenenisa is a member. The following year, she was third in the national championships 3000m in a hand-timed 9:26.0. Genzebe was in the lead pack that approached the start of the last lap, but Kenyan Pauline Korikwiang sprinted for home thinking it was the finish, everyone else followed, the announcer was himself confused and several girls - including Genzebe - stopped dead still, believing the race to be over. After they had been waved on, they never caught up to their original leading positions, and Korikwiang never finished the race, but Genzebe managed to take fifth behind a Kenyan sweep led by Linet Masai. “It was a race we should have won,” said Genzebe, a regret she carried with her until the following year. She ran 15:52.46 in 10th place over 5000m in New York that summer behind Tirunesh’s 14:35.67 win. “It was my first major track race and I couldn’t manage,” said Genzebe. 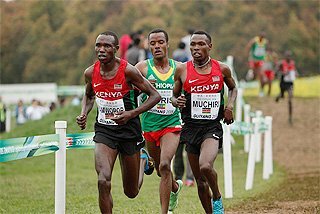 When the 2008 Edinburgh World Cross Country Championships rolled around, after taking second again at the nationals, Genzebe was ready to make amends for Mombasa. “It drove me,” she said. Genzebe kicked past Kenyan Irene Cheptai on a steep climb with 400m to go, and clinched the junior title. “We worked hard, we prepared well and we took it,” said Genzebe. Tirunesh, who had been suffering from stomach pains since the previous year, watched her little sister with anxiety and pride; and when the pain resurfaced in the middle of her senior race, she clutched her abdomen, fell back, but all the same dug in to claw her way back to victory, inspired by Genzebe’s victorious performance. “I was happier for her than I was for myself,” said Tirunesh. 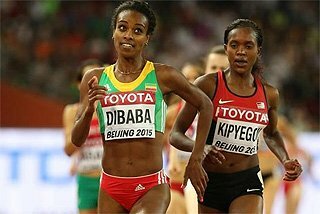 The Dibabas had a very eventful 2008, in which Tirunesh took 5000m and 10,000m gold at the Olympics, and her fiance Sileshi Sihine, the Athens Olympic silver medalist, repeated his performance in Beijing. Then, on October 26, the couple wed in a lavish ceremony in Addis Ababa. “I was a bridesmaid,” said Genzebe. “Tiruye and I took a break from our training,” she added, using an affectionate form of her sister’s name. Family members came from Bekoji, where the sisters had built a home for their parents in town, but their mother was already staying in Addis Ababa with her children. At the time, Genzebe was living with Tirunesh and Sileshi, while Ejigayehu lived nearby. 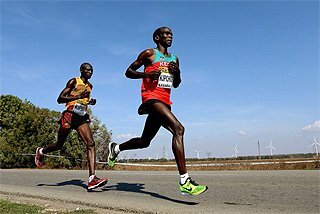 Genzebe and Sule continued a friendly rivalry in 2009, with Sule taking the Jan Meda national cross country junior title ahead of second-placed Genzebe, who was nursing a recurring knee injury, but Genzebe earned the big prize at the World Cross Country Championships in Amman, Jordan. She traded the lead with Kenyan Mercy Cherono on the hilly course, but prevailed on the final climb 100m from the finish. “I’m happier even than last year, because this year’s race was extremely difficult,” said Genzebe, who had received encouragement from the absent Tirunesh, then undergoing treatment for injuries. “I felt as if she was by my side, because she called me on my mobile phone while I was warming up at the venue,” said Genzebe, who heard from Tirunesh right after the race as well. “She was very happy,” reported Genzebe. The sisters planned to try and make the Berlin track championships together. “We have to run qualifying times, but if I do that, I would love to run with her,” said Genzebe, who won the national 5000m title in May in a sprint finish ahead of Sule. Recovering from her leg injury, Tirunesh ran the New York Grand Prix 5000m largely to help Genzebe run a competitive time below the entry standard in order to make the Ethiopian team. Tirunesh suffered a defeat herself at the hands of Kenyan Linet Masai and Genzebe missed cracking the 15-minute barrier, but placed third in 15:00.79. She broke through in a 14:55.52 in Oslo on 3 July behind Ethiopia’s then-defending World Champion, Meseret Defar, and Ejegayehu. At the African Junior Championships in Mauritius, Genzebe took gold ahead of Cherono and Sule, in what was a continuation of the rivalry with both young women. When not working with other members of a championships team, the Dibabas served as one another’s training partners. “We work together,” said Genzebe. “Tiruye, Ejegayehu and my brother Dereje.” Though the defending 10,000m champion Tirunesh eventually did not compete due to injury, she and Genzebe travelled together to the Berlin World Championships, where Genzebe got through the 5000m heats and placed eighth in the final at her first track World Championships. The 2010 season was the first Genzebe contested without “Tiruye” accompanying her on several races, as Tirunesh was mostly nursing injuries, but Genzebe navigated her way around the athletics world well after many years’ able guidance from her sister. Indoors, she ran PBs of 8:47.01 for 3000m and 4:04.80 for a 1500 win. After trying out for the senior cross country team headed to the Bydgoszcz World Championships and not making the cut, Genzebe was unprepared when the Ethiopian team asked her to run the junior race in her last year of eligibility, and she took 11th in Poland. Genzebe continued a season of 1500m success when she took the national title and clocked a 4:06.10 PB in the Doha DL. The next chapter of Genzebe’s rivalry with Kenyan Cherono played out at the Moncton World Junior Championships, where Cherono led frequently but Genzebe followed and the pair traded surges in the last two laps. Cherono stumbled while in front on the home straight and Genzebe took the gold, feeling that she could have done so even without her rival’s misfortune. 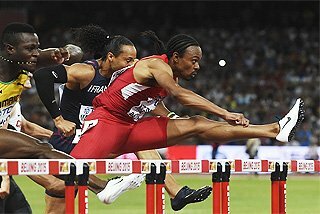 “I have better speed than her over the last 100m,” said Genzebe. Tirunesh’s parting words had accompanied Genzebe in Canada. “When I headed over here, she was fully confident that I would win,” said Genzebe, who ended the year with a 8:48.35 PB for 3000m and a cross country over reigning World Cross Champion Emily Chebet of Kenya. 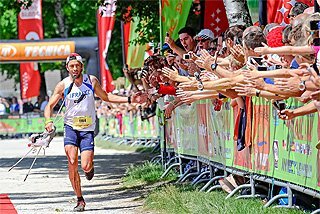 Genzebe then placed ninth in the senior race of the 2011 Punta Umbria World Cross Country Championships. She made the 5000m team for the Daegu World Championships when she took third in the rain-soaked Oslo DL in a new personal best 14:37.56 behind Meseret’s 14:37.32. In Daegu, the new 10,000m and defending 5000m World Champion, Vivian Cheruiyot of Kenya, the 14:20.87 world leader, was the pre-race favorite for the 5000 final, in which Genzebe stayed close to the front in the first half but faded to eighth in 15:09.35 as Cheruiyot collected her second gold of the Championships in 14:55.36. In Daegu, the new 10,000m and defending 5000m World Champion, Vivian Cheruiyot of Kenya, the 14:20.87 world leader, collected her second gold of the meet in 14:55.36 while Genzebe stayed close to the front in the first half but faded to eighth in 15:09.35. Genzebe moved into new territory in 2012, contesting the 1500m indoors with spectacular results. She won ahead of Kenyans Pamela Jelimo and Obiri in Düsseldorf after overtaking the pacemaker and pulling away decisively in the penultimate lap - but all three top finishers were disqualified for cutting into the inner lanes from the outside too early, and Genzebe’s unofficial 4:01.97 failed to count. She showed that win was no fluke when she took the lead with three laps to go in Karlsruhe two days later and smashed the 4:07.55 world lead with a 4:00.13 PB. Her time became the fifth-fastest ever at the time, behind sub-4:00 clockings that include World record-holder Elena Soboleva of Russia’s 3:58.28 and Ethiopian record-holder Gelete Burka’s 3:59.75. Genzebe took another victory over the distance in Birmingham, clocking 4:01.33 to become the holder of the two fastest times of the year. The World Junior 5000m Champion Genzebe appeared to have perhaps found her calling in the shorter event in which she was the 2010 Ethiopian champion outdoors, and she entered the Istanbul World Indoor Championships 1500 favored to win. Genzebe's outdoor season featured equally impressive performances over her new distance. 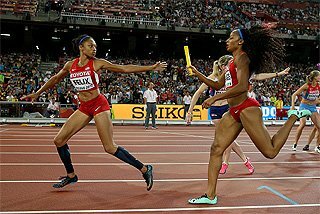 She ran a national record 3:57.77 in the Shanghai DL to dominate and win, but in Rome she lost the race and record to Abeba's 3:56.54 victory. Genzebe's Olympic dreams ended when she suffered a hamstring injury in the first round of the London 2012 heats and had to be helped off the track. The Dibaba family medal count did grow, though, courtesy of Tirunesh’s 10,000m gold. Genzebe continued her 1500m successes indoors in 2013, running the year's second-fastest time of 4:00.83 to win in Birmingham. That and her performances in the longer distances created a dilemma for her and eventually Ethiopian 2013 outdoor Worlds team selectors, as to which event should be her focus. Genzebe took a world-leading and personal best 8:26.95 victory over 3000m indoors in Stockholm and then after running a 3:57.54 PB in Doha outdoors for her specialty of the past year, the 1500m, she outkicked the London Olympic 5000m champion Meseret at the Shanghai DL, to run 14:45.93. “That's when I decided to run the 5000m at the World Championships,” said Genzebe. Her World Championships 1500m heats appeared to support her apprehension, as she barely made it into the automatic qualifications for the final. “I was really worried,” she said afterwards. “I thought I didn't make it. I found the race very tough.” Genzebe’s race in the 15 August final was similarly unspectacular, as she placed 8th. Once again, Tirunesh maintained Dibaba family honor with a 10,000m title. But Genzebe has been on a hot streak since the Olympics beginning with the Stockholm DL 3000m a week later, when she followed the new World Champion Meseret’s 8:29.30 world lead to a personal best of 8:37.00. Having not run the distance since 2010, Genzebe slashed over 12 seconds off her previous mark. Genzebe has been training with middle-distance coach Jama Aden of Somalia, who trains Sudan’s former 800m World Champion Abubaker Kaki and Djibouti’s Ayanleh Souleiman, among others, and the specialized coaching appears to have paid off. Indoors in 2014, Genzebe set her sights on the world’s best times, starting with Soboleva’s 2006 3:58.28 in the 1500m, which Genzebe chased in Karlsruhe on 1 Feb. “I felt I was ready for a World record,” she told the IAAF website when, after being paced to a little over 800m, she clocked 3:10.47 for 1200m, and sliced 3 seconds off the World Record to run 3:55.17, a nearly 5 second improvement of her 4:00.13 PB, and the fastest indoor or outdoor time since 1997. “I didn’t think I would run 3:55,” said Genzebe, who followed in her World 5000m Record-holder sister Tirunesh’s footsteps. Five days later, Genzebe tackled the World 3000m Record in Stockholm, where she had missed it by 3 seconds a year earlier. Running alone for the final 2000m, which she covered in 5:27.95, she slashed 7 seconds off Meseret’s 2007 mark of 8:23.72 to set an 8:16.60 World Record. The last time a faster women’s 3000 was run outdoors was in 1993. In her first two-mile race ever, Genzebe attacked Meseret’s 2009 world best of 9:06.26 in Birmingham on 15 Feb. With a 32.87 last lap, Genzebe clocked 9:00.48, taking over 5 seconds off the mark. 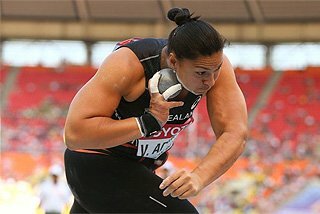 “To break three world records was what I’d planned,” she said, while also acknowledging the NIA stadium crowd’s support. Genzebe became the presumptive favorite for the Sopot World Indoor Championships 1500 or 3000. “I have a 1500m gold from last time, so this time I want the 3000m,” she said. In the Sopot final. She took the lead with seven laps left in a slow 3000m final on 9 March, taking gold in 8:55.04 ahead of Obiri and Bahrain’s Maryam Yusuf Jamal. Genzebe's outdoor season was not as spectacular but she ran 9:14.28 for two miles and won the Monaco DL in a 5000 PB of 14:28.88 ahead of her compatriot Almaz Ayana, to whom she lost the African Championships title over the distance. The pair shared the Continental Cup distance titles in Marrakesh, Almaz winning the 5000, Genzebe the 3000 (8:57.53). Genzebe introduced a major change in her preparations when she began training in Europe in the summer to escape Addis Ababa’s rainy season, which she found difficult to train in. She spent time in Spain and Sweden during the 2014 outdoor track season. Genzebe added to her indoor World record haul when she ran 14:18.86 in Stockholm on 19 February 2015 to erase Meseret's 14:24.37 mark from 2009. In April, Genzebe was named the Laureus Sportswoman of the Year for 2014. 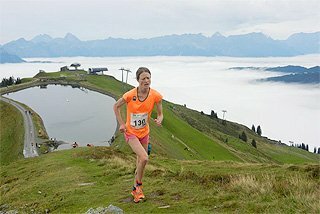 She then set out to prove she could have stellar outdoor seasons as well as indoors, and while continuing to train overseas in the European summer – in Spain in 2015 -- she made a series of attempts on the 5000m World record of 14:11.15 held by her sister Tirunesh, repeatedly lowering her own PB though never threatening the mark. Genzebe won DL races in Eugene (14:19.76), Oslo and Paris, where on 4 July, she defeated Almaz in 14:15.11 to the latter's 14:21.97. But their true relative strengths over the distance were unclear as Almaz had run a world-leading 14:14.32 in Shanghai in May and the women’s plans to share the pacemaking in Paris had fallen apart mid-race, with Almaz doing the bulk of it. 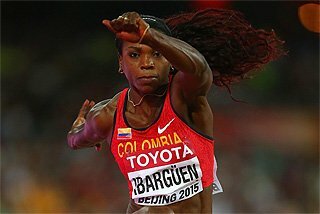 Then Genzebe ran 3:54.11, the fastest time ever run in 18 years, on 8 July in Spain and she subsequently attacked that World record of 3:50.46. 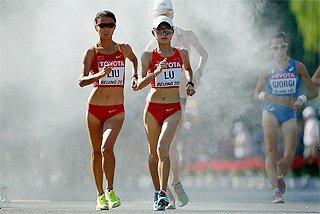 On 17 July in Monaco, she ran 3:50.07 to smash it, and she followed that up by deciding to double in the 1500/5000 at the Beijing World Championships, where she was seen as the favorite in both distances. Almaz won the final DL race in Zurich too, but Genzebe's point total in the series got her the Diamond trophy, and her year earned her the IAAF female Athlete of the Year award. Indoors in 2016, Genzebe continued her record-breaking streak when she ran a mile World record of 4:13.31 to erase Romanian Doina Melinte's 1990 mark of 4:17.14, clocking 3:56.46 for 1500m enroute. 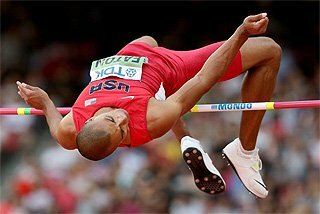 “I have been able to fulfil my dreams here at this arena,” Genzebe said of the venue, the Stockholm Globe Arena, in which she had set two World records previously. Genzebe ran a world-leading 8:22.50 for 3000m, the second-fastest time ever, in Sabadell, Spain on 19 February, clocking a final lap of 31 seconds after taking the lead at halfway. After having initially hoped to double in the 1500/3000 at Portland 2016, she chose to only run the longer event. Her compatriot and the former four-time champion Meseret ran 8:30.83 in Boston in February upon her return from maternity leave, and she is Genzebe's teammate and challenger in Genzebe's defense of her Sopot World Indoor Championships 3000m title. 1500/3000/5000: 2006 – 9:26.0/-; 2007 – -/15:53.46; 2008 – 8:53.72/15:02.41; 2009 – 8:50.48/14:55.52; 2010 – 4:04.80i, 4:06.10/8:47.01i, 8:48.35/15:08.06; 2011 – 4:05.90/-/14:37.56; 2012 – 3:57.77/-/-; 2013 – 3:57.54/8:26.95i, 8:37.00/14:37.68; 2014 – 3:55.17i, 4:01.00/8:16.60i, 8:26.21/14:28.88; 2015 – 3:50.07/8:37.22i, 8:26.54/14:18.86i, 14:15.41; 2016 – 3:56.46i/8:22.50i/-. Prepared by Sabrina Yohannes for the IAAF ‘Focus on Athletes’ project. 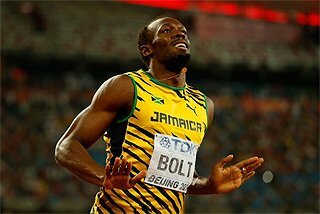 Copyright IAAF 2011-2016.